Ah. I remember our own “launch” back in 2006. It was a grand thing. We booked a room at Discovery Suites for half a day and we invited a number of corporate managers to a free “product launch” of our Flexible Benefit services in STORM. Since we didn’t really put in a lot of cash in the venture when we started, this was a major, major expense for us. We filled the room with people carrying important-sounding business cards. And yeah, we felt like we had it made. Of course, it was a flop. Not one person in the room bought our product. If anything, we just broadcasted to some very important people how silly we were. We didn’t exactly learn our lesson fast. Undaunted, around a year after we tried exactly the same thing with another product – this time though, we had free wine! Not one person in the room bought this new product. We got our first sale for this product much more organically – by talking with and cross-selling to an existing customer. Take note that launching is different from starting or incorporating. “Starting” happened when you got your founders together and momentum was built. 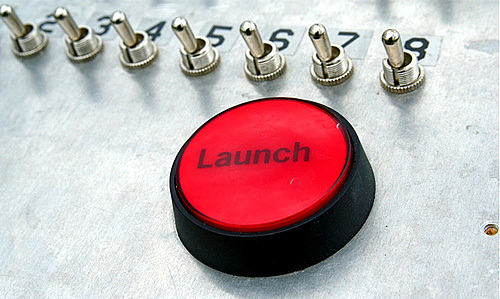 “Incorporating” happens independently of these six steps to startup launch. Indeed, you can incorporate at any time within the process. Launching is when you let everyone know about it in one sitting – through a press conference, or a large newspaper article, or when you have a big product launch event. In a launch, the name of the game is to talk about how great you are, about how your product is the best and how it will change things. Chances are, this early in the game, you startup is the complete opposite – you are making mistakes, iterating, fighting multiple fires at the same time. There’s a small chance that you can actually live up to the expectations that come with a big launch. Moreover, this early in the game, the amount you will be spending to do your “launch” might best serve you in some other way (payroll, iterating). If you absolutely have to though, then do it as late as possible in the ballgame. Perhaps when you have a small number of customers already. One simple, efficient rule you can follow is that your launch has to be funded by profit funds already, as opposed to initial investment funding. Think of all the great startups you know. No, you probably did not get to know about these startups through some “launch” or press event. Didn’t they just sneak up on you? Perhaps a friend told you about it. Instead of “launching,” then think instead about how you can develop the small customer base you already made during the feedback and iteration phase. If you have a B2B service concept, then you can ask them if they can refer anyone else who would benefit from your product – and then give them a good incentive. If you have a web application, think of how you can make your service go viral – the Dropbox viral strategy is a great example. If you have an actual product, then network with potential distributors and negotiate good deals. The point is to go out and do. Go out and do. Go out and do. With perseverance, passion, and creativity, you’d be surprised about what you’d have in your hands after some time. THEN perhaps, it might be good to think of that launch. Nice post. The launch really can be a sort of lie, convincing folks you’re great when you actually as you put it are “fighting multiple fires”. Great points indeed. Exactly. Then if they find out who you are at this point, it’s very easy to lose customers.